I just rolled out of bed, it’s cold outside, I’m feeling lazy and I’m hungry. This is a typical start to a wintry Saturday or Sunday morning in my household. If you ever feel the same way, don’t worry — I have the ultimate comfort food for a cold winter’s morning. 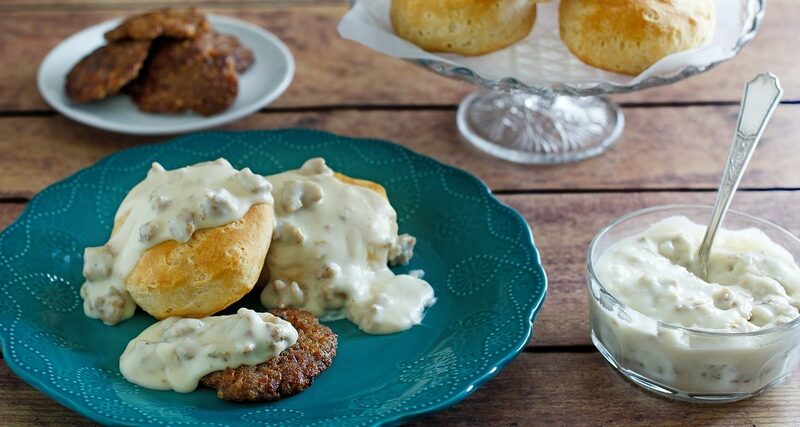 Biscuits and sausage gravy is a staple of Southern cuisine, and my rendition can be ready in less than 30 minutes. With just a few ingredients, your chilly morning will warm right up. I can remember waking up at my grandmother’s house to find her in the kitchen making breakfast. She would usually be on the phone while standing over the stove stirring the sausage gravy, and the smell of sausage would permeate the entire house. I would sit down at the table, and she would serve me a plate with so much gravy I didn’t even know if there was anything under it. 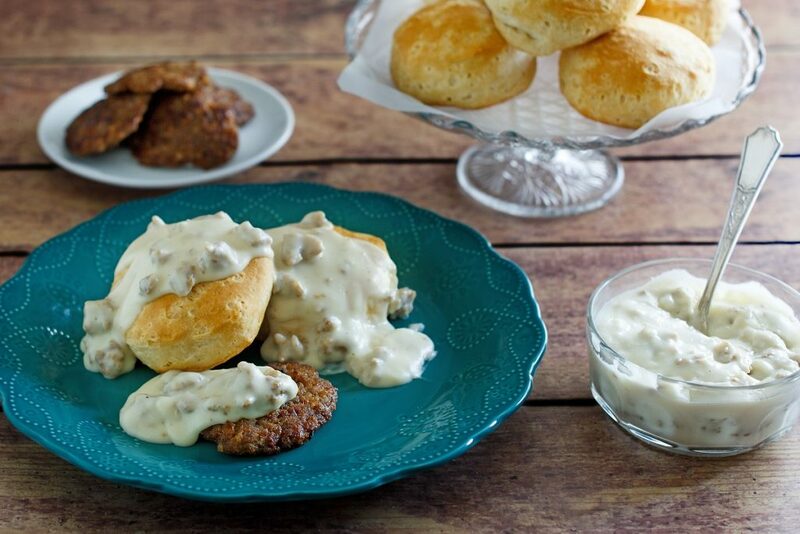 The silky smooth gravy with bits of sausage made the perfect blanket to her fluffy, buttery biscuits. Calories? What are those? There is not much about this recipe that is healthy, although, there is milk in it so I’m going to regard it as a good source of calcium. The sausage recommended is pork so that a good grease base is formed from the rendering. You can certainly use turkey sausage or chicken sausage, but if you do that you might want to consider using more butter as a base because there will not be much grease. You could also use 2% or 1% milk for a healthier alternative, but because those are more watered down, you will likely not need as much. You can also use wheat flour for a more health-conscious approach, but I have found that wheat flour takes more butter or grease to bind it; it also doesn’t scorch with the same taste as white flour. You might have noticed that this recipe is really simple, and that’s the point. As I said, I am feeling lazy on winter mornings so I use store-bought biscuits, but feel free to make your own. So while I personally think this recipe is delicious as is, if you’re the type that likes to add your own personal touch to a dish, feel free. You can use flavored sausage for an added twist. Some like to add sugar instead of salt for a sweet gravy. You can substitute chipped beef for sausage and have it for dinner over chicken. The options are really endless, but for a good down-home cookin’ kind of breakfast give this recipe a try. Enjoy! 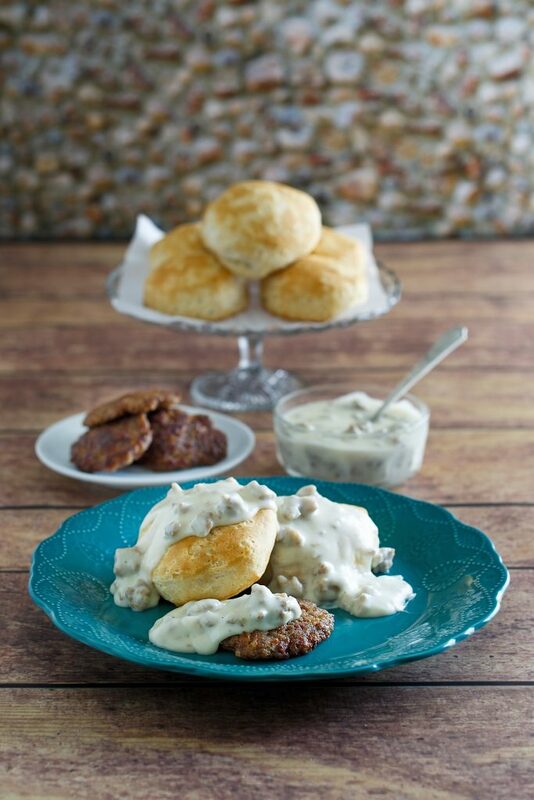 Who’s on board for the ultimate Southern comfort breakfast?! Bake the biscuits per the instructions and set aside. Place a large pan on the stove set to medium-high heat. Separate the sausage into equal halves. Make six patties with half of the sausage and cook patties in the pan until done. Remove patties and set aside to drain on a paper towel or cooling rack. Do not drain the grease from the pan. Tear the other half of the sausage into tiny crumbles and drop in the pan and cook well. Do not drain the grease from the pan. Reduce the heat to medium and add the butter into the pan of sausage crumbles and grease. From now on you cannot walk away from this pan as you must constantly stir. When the butter melts fully, add the flour and stir for about 2 minutes to get a slight scorch on the flour; it will be very paste-like in texture. Pour in half the milk and continuously stir until it is mixed well. Turn the heat to low or off and add the remaining milk and continue to stir. Add the salt and pepper. The gravy is now done, but if you leave it on the heat or do not serve it right away you might want to add more milk to keep it silky. 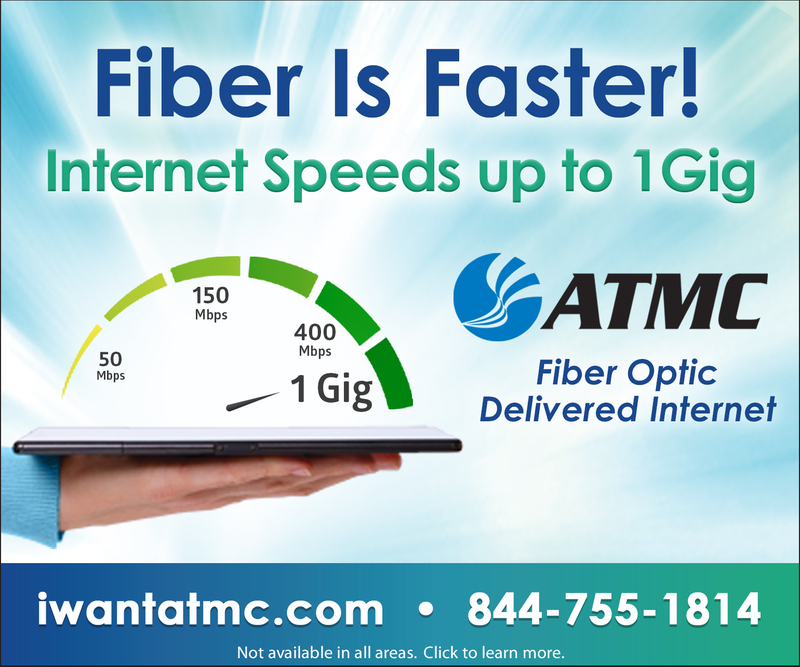 The longer it sits, the thicker it will get. Place two biscuits and a sausage patty on a plate and smother it all with the gravy goodness.